Teaming back up with director Doug Liman, Tom Cruise is having a ball again on screen and American Made is a better film because he is so engaged with the material. The story of Barry Seal is a fascinating one and Liman's film takes a unique and energetic approach in telling it. Has a cockiness about it, but is smarter than it looks, landing politically-tinged jabs alongside over-the-top laughs and a free-wheeling tone and feel. You just can't "Tom Cruise" anymore. If you believe that Ronald Reagan's presidency was one largely without scandal and his administration's dealing in Central America was exaggerated and overblown, then this is probably not the movie for you. This plays like a distant cousin to Martin Scorsese's The Wolf of Wall Street. If you didn't care for that film, you likely will be just as dismayed by this one. There is something to be said about seeing Tom Cruise having fun again on screen. I know, I know. He's a crazy Scientologist. He forced the children he adopted with Nicole Kidman to never speak to her again after their divorce. He never sees Suri, his daughter with ex-wife Katie Holmes. He jumps on couches. He is downright creepy in those Scientology videos Alex Gibney showed us in his Going Clear documentary. Believe me, I understand. Cruise is a tough one to embrace. However, at one time, and not all that long ago, he was a bonafide megastar who could not miss at the box office. Lately, as his public life has devolved into a PR person's nightmare, his box office returns have dipped. Perhaps his nadir came with The Mummy, one of 2017's worst films, and a project riddled with Cruise's off-screen demands and reports that he was fiddling around in the editor's suite and behind the camera. Some felt that maybe Cruise's erratic behavior had finally got the best of him. But then along comes American Made. And for 115 minutes, all feels (mostly) right again. Though now in his mid-50's, we see a familiar gleam in Cruise's eye and a youthful enthusiasm which has been absent for awhile. Hey, look, I understand. I get all that other stuff, and I understand if it's a barrier for some of us out there. However, Cruise is really fun to watch here. He dives into the role of Barry Seal, this story based on true events. Seal is a bored, unsatisfied TWA pilot, who is contacted in 1978, once his smuggling of Cuban cigars is discovered, by the C.I.A. As a trade-off, he is offered the chance to fly top secret missions for the U.S. government. The C.I.A. agent, Schaffer (Domhnall Gleeson), promises Seal he will be taken care of and he brings the news home to his wife Lucy (Sarah Wright Olson), instantly worried about insurance, income, and all the rest. With a boyish grin we grew accustomed to seeing Cruise pull out of his toolbox pretty frequently, Cruise's Seal assures her all will be okay. Things escalate. Seal begins taking surveillance photos and serving as a liaison of sorts between the C.I.A. and General Manuel Noreiga (Alberto Ospino). He soon is stopped by three Columbian drug lords, who would later become known as the ringleaders for the infamous Medellin Cartel. Before too long, Seal finds himself in the heart of a powder keg waiting to blow. Medellin representatives, including Pablo Escobar (Maurijio Mejia), cut Seal a deal where they will pay him $2,000 for every kilo of cocaine he can deliver for them. Arranging the drop offs in Louisiana, near where he lives in Baton Rouge, Seal begins making copious amounts of money. The C.I.A. cut themselves in and start giving guns to Seal to deliver to a group of freedom fighters, the Contras, secretly supported by the President after a Congressional ban on aid and/or support to the organization was implemented. American Made doesn't take this rather remarkable slice of history all that seriously, and you realize that for director Doug Liman, and writer Gary Spinelli, deep and insightful political storytelling is for another director's movie. With that said, Spinelli sticks a few jabs in the side of those who believe the Reagan Administration was largely squeaky clean and scandal-free through this whole mess. The movie propels its way through eight years of time, beginning in 1978 and concluding in February 1986, soon after Seal finishes up recording a series of videotapes where he shares everything he took part in. Along the way, Liman paces his film in a rambunctious, go-for-broke style that finds Cruise laughing a lot and commanding the screen. Surrounding him are a number of good, but underwritten performances, including that of Olson's Lucy, a concerned mother and wife, who becomes romanticized into looking the other way when the family is literally stuffing and burying shoeboxes of cash all over their property. Gleeson's C.I.A. agent is played in such a way that you begin to wonder if Seal is something of an unreliable narrator every time the two share time and dialogue on screen. 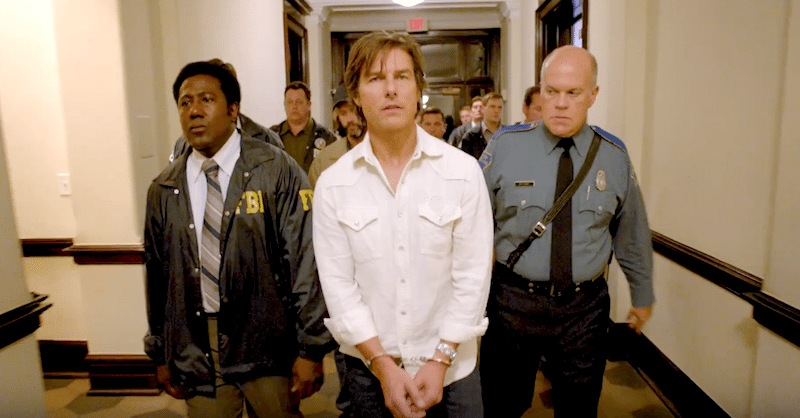 In some ways, American Made is reminiscent of a less vulgar The Wolf of Wall Street, with Cruise, like Leonardo DiCaprio, nearly beating the system through illicit affairs and partnerships. Though Spinelli fails to properly heighten the stakes when Cruise is knee-deep in trading drugs, guns, cash, and all the rest, he and Liman build to a knockout blow of a moment near the end which takes your breath away. Played for comedy for much of the nearly two-hour running time, American Made is fun and entertaining overall. Though the movie may struggle with defining the historical significance of this story, the movie exists in a more reckless and enigmatic time period. Liman crafts an air of cockiness within the film and lets it strut around a bit. Mean-spirited at times, condescending in others, and full of great cinematography and a rhythmic-like cadence to the editing, sit back and allow yourself to take things a little less seriously than you normally would. Oh, and while we are at it, let's all try and forget Tom Cruise ever made The Mummy. Starring: Tom Cruise, Sarah Wright Olson, Domhnall Gleeson, Caleb Landry Jones, Alejandro Edda, Mauricio Mejia, Jesse Plemons, Jayma Mays, Lola Kirke, Alberto Ospino, Robert Farrior.